Another month, another visit to 55+ communty at the lake.Â Life is good.Â This time Mary Ann and I visited the Del Webb community at Lake Oconee Georgia that was started about two years ago.Â We did the vacation getaway for two nights staying in one of their villas. I think the price was about $190 including tax for the two night stay. We arrived Sunday at about 3pm which is their check in time.Â Sandy greeted us with big smile and good conversation at the sales center. Â We met George our sales counselor and set an appointment for 10:30 the next day to meet with him and get the tour.Â We followed Sandy over to check us in the villa model where we stayed.Â Â It was clean and looking good.Â The villas seem bigger once you actually stay in one. We jumped in the golf cart in the garage and headed to the lake front.Â There was several boats at the community docks including 5 or 6 pontoon boats.Â It seems everyone has one. We walked up to the covered pavilion which was large, including a fireplace, many sets of tables and chairs, an outdoor grill and a nice view of the lake and docks. On the way back, we saw the 80 sots for boat and RV storage with an automated gate and some of the walking trails. Next we took the golf cart up to the clubhouse, oops I mean the Amenities Center.Â Bob met us at the door (expecting us?) and gave us a tour of everything. Tom lives at the community and works part time, moving from Michigan via Canton GA.Â The indoor pool was lovely, outdoor pool and spa also, giant ballroom with kitchen, game room, exercise room, pool room, craft room, etc.Â But where was all the people?Â It seems Sunday night is a slow time at the amenities center which is expected. We head back to the villa and then head out to one of the restaurants mention by George, the Big Catch.Â Mary Ann had a fish sandwich and I enjoyed a fish reuben sandwich, which were good. Â Sleep well. Next morning we made coffee and had cereal and toast.Â The villa has all appliances, micro and toaster.Â We meet up with George and after chatting got the overview.Â This community will have 850 properties and about 130+ have already sold.Â The sign in the lobby says 11 sales in the last 40 days.Â We let George know Bob already gave us a tour of the Amenities Center the day before.Â Most of the people who bought homes come from all over.Â I was surprised to see so many states represented by yellow pins in the map of the US where people are from.Â Must have been 25+ states or more, mostly in the Eastern half of the US (and some from overseas). Next we toured the models. George got us started with the first one to show us what was included and what was an upgrade.Â It starts with the smallest and then every model gets bigger.Â Must have been 7 model homes we toured.Â At first we thought we needed a basement, but after touring the models, we changed our minds.Â You can get a loft and upstairs bath if you need more space, and at a lot better price.Â George offered to show us a home with the loaf and Mary Ann said she would like to see it.Â George really was very helpful and not pushy at all.Â Â I think Mary Ann was ready to sign up for the Vernon Hill with the Loft.Â I agreed that was our favorite.Â Another feature we really liked for the sunroom and why not add a screened porch to boot?Â Â Yes, that would do it. We spend about 2.5 to 3 hours and before leaving George presented us with a card for $50 credit at Filet’s, the fancy steak house at the corner of Linger Longer Road, and two tickets to the movie theater.Â We had our evening planned. So we drove hwy 44 up to the town of Greensboro which I don’t think we have ever visited.Â It has interesting little downtown of antique stores, sidewalks and restaurants.Â We asked a local for a place to go for lunch and she pointed across the street to Yesterdays.Â Since we were going out for steak later, we both got vegetables.Â We loved this place.Â Southern style food, fried okra, squash casserole, fried green tomatoes, collard greens, etc. Of coarse they had meats and fish also.Â All at a very reasonable price. Out tab was $10 for both our meals. Back to the villa to take a nap.Â Then to the Amenities Center where a group was out playing Pickleball.Â You play with paddles kind of like ping pong but on a court smaller than a tennis court.Â There were maybe 15 people at this outing.Â Inside I check my email one of their computers.Â That night we did visit Filet Steak and Seafood at Lake Oconee Village. Mary Ann got the encrusted salmon and I got the filet. This is a top notch restaurant and we both enjoyed our meals.Â Thank you George. Overall I was very impressed with Del Webb at Lake Oconee.Â No they did not pay me anything. They didn’t even know I have a web site and are not a paid advertiser.Â We just try to visit with the eyes of someone looking at 55+ community to live in and at age 62 and retired, that just comes naturally. More retirement homes at Lake Oconee Georgia. It seems I hear more and more about St. Simons Island Georgia as a vacation spot, a second home location and now a great retirement place. St. Simons Island is part of the legendary Golden Isles near Historic Brunswick, Georgia, St. Simons Island lies between Jekyll Island and Sea Island. 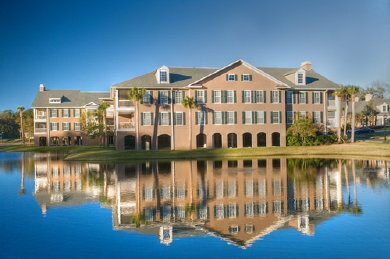 Marshâ€™s Edge is a full service senior community located on the beautiful Saint Simons Island.Â From the photos on their web site, it looks simply gorgeous, with lakes and live oaks around the property.Â Already a vacation and second home destination, Marsh’s Edge is in theÂ midst of legendary golf courses, distinctive boutiques, art galleries and antique shops. I can imagineÂ living hereÂ withoutÂ the worries about home maintenance, yard work and other chores.Â It would be like being on vacation all the time. The Wellness Center includes senior friendly exercise equipment and an indoor swimming pool. This is a Continuing Care Retirement Community. CCRCs are so named because they address the entire continuum of care with healthy seniors moving into independent living apartments, but having the security of knowing they can “age in place” thanks to assisted living and skilled nursing services on site. I think a trip to check out Marsh’sÂ Edge on St. Simons Island would be interesting and worthwhile. We just visited Del Webb’s new Active Adult Community at Lake Oconee Greensboro Georgia.Â Lake Oconee has been a hot spot for those fortunate enough to “retire to the lake” for years. It is the home of Reynolds Plantation where homes go from $400,000 to well over a million.Â The area has developed high end shopping and gourmet restaurants.Â I have heard a lot about Lake Oconee and now after visiting can see why it is a very nice place to live. At the entrance will be a large community monuments with a gorgeous waterfall feature that should give quite an impression. Then the gated security follows as you enter this new 55+ community.Â The sales center and model home park will be on the right. Looks like maybe 12 model homes from my count.Â The 21,000 square feet activities center will be nearby.Â The elevation slopes as you follow the Del Webb Parkway through the community towards the lake.Â At the lake there will be two boat ramps and docks with about 40 boat slips for the community.Â On the hill to the left will be a nice covered pavilion for picnicking with a view over the lake.Â A quite interesting feature being planned is a RV and boat storage facility right on the property.Â That would be nice to have your boat right in your community next to your boat ramp with no highway towing necessary. We have toured two other Pulte Del Webb communities and were very impressed by the livable, energy efficient floor pans. There will be the same floor plans offered here, plus Villas.Â There will be 895 lots on 400 acres, so this is a reasonable size community. Del Webb at Lake Oconee community is locatedÂ off Lake OconeeÂ Parkway in the middle of Georgia’s Lake Country and very near the Lake Oconee Village shops. Looking forward to going down to Del Webb’s Lifestyle Seminar for their new 55+ active adult community on Lake Oconee.Â I signed up on their web site, and got an invitation for Friday August 3rd. The meeting is going to be at the Ritz Carlton Lodge at Reynolds Plantation, so that will also give me a chance to visit that property that I have heard so much about. This will be my first trip to Lake Oconee. 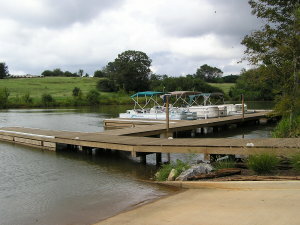 I recently visited Lake Sinclair down hwy 441 at Milledgeville. They told me both Lake Oconee and Lake Sinclair have pretty constant lake levels which at mainted by Georgia Power. So the lake does not go way down in Winter or even a draught, like some other Georgia lakes. One of my friends is almost a professional fisherman entering fishing contests all over the country, and he says the fishing is great. Well I haven’t fished too much since I was a kid, but it would be fun to do again. I wonder if the Lake Oconee Del Webb community will have a 35,000 square foot club-recreation-activities center with a lifestyle director like their property at the Village at Deaton Creek up by Chateau Elan NE of Atlanta?Â I will find out. Will be interesting also to see how the dock and association owned boats will work. Do you just pay a fee to use them?Â If so, that may not be a bad idea.Â As a former boat owner $$, I think I would rather rent. Is it true they may be building their own town with this 55+ community?Â That would be nice.Â I am sure there must be already a good many stores and restaurants with all the other lake property homes and communities there at Reynolds Plantation.Â As far as I know this will be the first Active Adult Community at Lake Oconee. 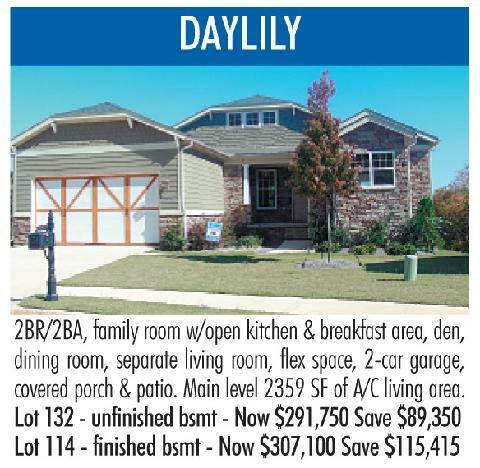 I hope they have some of the same model home plans that I saw at Deaton Creek. They had eveything we always dreamed of. My wife really like the cabinets in the kitchen and master bath. I will take plenty of pictures and make a report when I return. In the meantime, I will try to find out more about the Lake Oconee community.